Last Friday we caught up with the inaugural Critical YAK, an informal aquatic gathering hosted by Matt Yauch, Reed Martin and Stephanie Simonson. 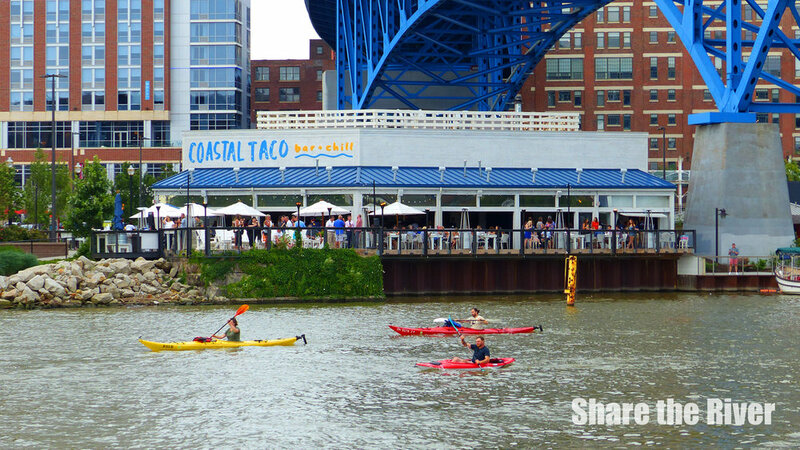 After sharing the Cuyahoga River Safety Task Force's safety card and checking Marine Traffic, the kayakers put in at Cleveland Metroparks' Merwin's Wharf dock, paddled 1.7 miles down the Cuyahoga River out to Lake Erie, hung a left and beached at Wendy Park for some fun at Whiskey Island Still and Eatery before returning to Merwin's Wharf. We chatted with one of the organizers, Matt Jauch, on how the idea for Critical YAK got rolling (think Critical Mass). We imagine we'll be seeing Critical YAK's posse on the Cuyahyoga River some Friday in August!